Late last week, I learned about a great website that I think is worth sharing: ev’reward. I strongly believe in going through a portal whenever I online shop, so once I find something I want to buy, I put it in my check-out basket and then visit several portals to find out which one is giving the highest mileage or cashback return for that store. As I showed a while back, there isn’t one portal that is always the best – some portals have more partner stores than others, and the highest miles/ cashback yield varies by portal and store. And while I still visit several online portals, I admit that checking every one is a fairly time-consuming process if all you want to do is click “buy” and have an item delivered to your house. Step in ev’reward. Through this website, you don’t have to decide whether visiting each portal is worth it for you – ev’reward automatically visits them and tells you what their deals are! All you have to do is type the name of the online store from which you’re buying something, and ev’reward gives you a list of portals and the miles or cashback each one will give you for making a purchase from that store. This cuts the research process to just a few seconds, and you can immediately see which portal will suit you best. There are only two caveats that I’ve seen so far. First, some rates are a little outdated. For example, United’s Mileage Plus Shopping Portal is currently offering 2.5 miles per dollar spent at Banana Republic online, but ev’reward is showing only 2 miles per dollar. Second, it doesn’t list every portal out there, so that if you typed in “amazon.com,” you wouldn’t know through ev’reward that Hawaiian’s and US Airways’ shopping portals currently give miles for Amazon purchases. Nonetheless, if you usually check several portals like I do before buying, ev’reward is a great starting point to find out which ones are even worth looking into. In the case of J.Crew, for example, ev’reward correctly does not list ShopDiscover as a cashback portal, so I know there’s no point in checking, which saves me some time. On the other hand, if you are not planning on investigating each portal before buying, with the ev’reward output, you can at least be sure that if you go through any portal on its list, you’ll get more miles or cashback than if you didn’t go through one at all. To save when shopping online it is well established that you should (1) run a quick search for coupons and (2) shop through an online portal if you can. But until recently, if you were buying anything on Amazon, there was no way to double-dip. You could of course get points/miles through your credit card, but there wasn’t any portal offering points/miles or cash back for Amazon purchases. 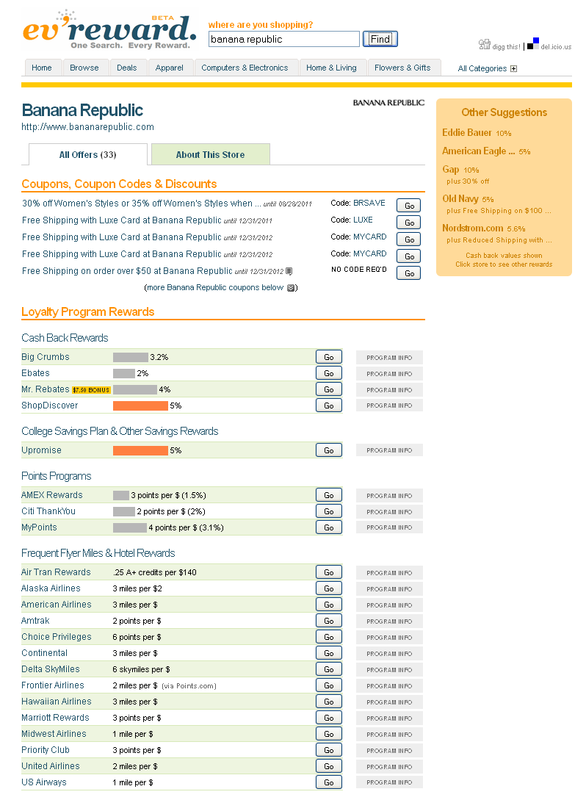 This changed very recently: now, US Airways’ Shopping Mall now gives 1 mile per $1 spent on amazon.com and Hawaiian Airlines’ eMarket gives 2 miles per $1 spent! If you are a member of any of these two airline programs and make a lot of purchases on Amazon, this is amazing news. All you have to do is register at the respective portal, and remember to reach Amazon by clicking through the portal link rather than typing it on your browser bar directly when making a purchase. If you shop on Amazon frequently but are not a member of US Airways’ Dividend Miles or Hawaiian’s HawaiianMiles frequent flier programs, there may still be something in it for you. Depending on how much you shop, it may be worthwhile to set up an account with either of the two programs and start accumulating miles anyway. A purchase here and there may not seem to make a difference, but given that membership is free and, for both programs, miles do not expire as long as you have an activity in the account every 18 months, if you buy stuff on Amazon there’s really no reason not to set up an account. In the worst case scenario, your miles expire and you earn nothing – and lose nothing. In the best case scenario, you either shop frequently enough to keep the account going and accumulate miles for a ticket eventually or, even better, you learn that you spend more on Amazon than you anticipated and earn a free ticket in no time. When deciding for which of the two programs to sign up, there are some things to consider. On one hand, US Airways is a larger airline with more partners, so if you are looking for a mileage program in general, it’s a good bet. Once you’ve set up the account, you can always credit flights you take on US Airways as well as on other Star Alliance members, including United/Continental and international carriers such as Thai and Lufthansa, and accumulate miles even faster. On the other hand, while Hawaiian is not in an alliance and only has 4 airline partners (Delta, Island Air, Korean Air, and Virgin Atlantic), its portal offers twice as many miles per dollar spent on Amazon. So, if you don’t fly on any of US Airways’ or Hawaiian’s partners, or already have your favorite frequent flier program, Hawaiian may be a good option just for earning those Amazon miles. Also, as has been pointed out by some very savvy people who know the ins-and-outs of frequent flier programs, every 5000 HawaiianMiles can be converted into 10,000 Hilton HHonors points, making this a compelling deal for Hilton HHonors members too. Amazon’s new participation in US Airways’ Shopping Mall and Hawaiian’s eMarket portals is exciting news in general. For members of HawaiianMiles, US Airways’ Dividend Miles, or Hilton HHonors benefits could be great. But even if you aren’t a member of any of these programs, if you shop a lot on Amazon, there are probably still gains to be had by going through one of the two portals. And if you’re still not convinced, you could also sit back and wait: maybe Amazon’s participation in these two portals is a sign of even better times to come, when Amazon is giving miles, points, or cash back on every shopping portal out there. For earning miles, the Citi/AAdvantage credit cards are fairly good ones, offering 1 mile per $1 spent (or 1.2 miles per dollar until May 31st for me, as I wrote about here) and relatively low annual fees starting at $85. But Citi/AAdvantage credit cards come with another perk that is often overlooked. Credit card holders are given access to quarterly offers for Reduced Mileage Rewards for domestic trips. Although I generally do not recommend redeeming miles for domestic trips since international trips are usually a better deal in miles-per-dollar saved, with the Citi/AAdvantage card, it is an option worth considering. In general, round-trip domestic flights go for 25,000 miles on almost all airline programs, but every quarter Citi Gold/AAdvantage and Citi/AAdvantage American Express card holders are given a list of cities in the United States and Canada to which they can travel using only 20,000 miles (45,000 for business class). Citi Platinum Select/AAdvantage, Citi Select/AAdvantage American Express and CitiBusiness/AAdvantage card holders can fly for slightly less: 17,500 on economy or 42,500 on business. At Money Under Your Futon, we’ve frequently encouraged our readers to sign up for mileage and points accounts with their favorite airlines, hotels, and stores. But not being able to redeem miles/points or shedding more of them than you would like can undermine even the most diligent efforts to accrue them. Condé Nast’s concierge.com sheds some light into the mileage redemption process in a recent article. Writing on “How to Maximize Your Miles,” they offer 10 tips for getting the most out of your mileage account, from well-known advice, such as looking for seats in code-share partner flights, to the more obscure but probably equally useful, including calling airline companies after midnight on a weekend and, if your home airport is an airline hub, considering a frequent flier program that is not from that airline but from one of its partners instead. To read the full article, click here. Over the last few months I received three invitations from American Airlines/ American Express to sign up for a new joint AA-Amex credit card that would not have an annual fee as long as I kept my current American Airlines Citibank MasterCard as well. As a sign-up bonus, the AA Amex card would give me 20% more miles during the first 12 months. I assume this offer was sent to all AA Citibank card holders, and although I contemplated signing up for the card, I ultimately decided that 20% was not enough to convince me to add another card to my wallet. Next time you check into a hotel, consider signing up for its loyalty program. Even if you are not a frequent flier, or usually stay with friends or relatives when traveling, you should still make the most out of your occasional hotel stay. Travel is not the only source of frequent flier miles. With proper planning, you can often score miles through online shopping, credit cards, and evening dining out. But another source of miles – grocery shopping – is soon to dry up. Safeway recently announced that, as of February 28, 2010, it will no longer award airline miles to its customers. Until then, customers can earn 125 miles for every $250 in purchases at Safeway and other stores within its group. Although a rate of 1 mile per $2 spent is not great, Safeway’s partnership offered a good deal for regular patrons – and could be combined with airline credit card offers for even more miles. But this turn-around does not mean customers are necessarily losing out. There are still other ways to score deals at Safeway. First, Safeway has had to cut out this program presumably because it is now offering more frequent sales and deeper discounts in face of the economy. Second, you can still take advantage of online coupons that can be uploaded into your Safeway card for more discounts. Third, you can enroll your Safeway card with UPromise to earn cash back in your UPromise account for purchasing specific items from various brands including Nestle, Hefty, and Florida’s Natural. Customers are only allowed to enroll their Safeway card in either the miles program or in the UPromise program, but, with the miles program about to be canceled, that decision has already been made for you. The cash back rate for groceries on UPromise is generally low, but it is better than no miles or cash back at all, and can be much higher when combined with the eCoupons you can upload from the UPromise site. If you are close to reaching the $250 threshold for 125 miles, make sure you do that before the end of this month. But if you are not, you may as well switch your Safeway card to UPromise and start earning that cash back as soon as possible. To learn more about UPromise, check out our previous post on the program here. Saving for Retirement through a Credit Card? Not So Fast.